The ambient light sensor on the newer Unibody MacBook Pro (all models: 13″, 15″, 17″) is located directly next to the iSight camera at the top of the display. You can verify the location by holding your hand over the area to the left of the iSight camera and watch as your screen dims and the keyboard lights brighten. The location of the ambient light sensor on the pre-unibody older MacBook Pro’s (all models: 15″ and 17″) is located inside the grills of the speakers near the keyboard. Again you can verify this by holding your hands over the speaker grills and watch as the screen backlighting adjusts based on the change in the ambient lighting. If you’d like, you can stop the MacBook Pro screen from dimming by adjusting various System Preferences. I have used a program named “Lab Tick” to manually control the keyboard brightness (usually to shut it off, since I use an external keyboard). Works very nicely – highly recommended. 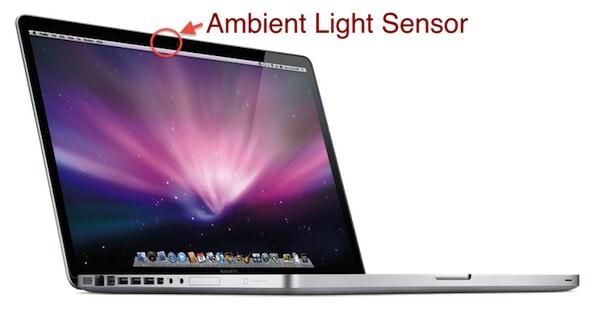 I cannot find the sensor on my MacBook Pro – it’s the first model that came out and I don’t see it next to the iSight. Can’t get the backlight to come on….any further ideas please?